By now most people know about Jim Gaffigan’s obsession with food. It’s his bread and butter. Over the course of several albums and comedy specials the lovable lug has dissected Hot Pockets, McDonald’s shame spirals and the beauty of bacon. Gaffigan’s comedy is sort of like a funnier Supersize Me—you’re either completely disgusted by what he’s saying, or you’re secretly thinking about how delicious a Big Mac sounds. In keeping with his preoccupation with his own physique, Gaffigan also says no to vegetables and fruit (“Has peeling an orange ever been worth it? There’s not even chocolate in this”), and yes to entire pints of ice cream in one sitting. Gaffigan also offers a few astute observations on ridiculous wedding rituals, mostly the idea of a groom throwing his bride’s garter out to a sea of perverts. Or making a trip to Victoria’s Secret and feeling awkward well after leaving the store when he goes into a Burger King to order a Whopper with a bright pink bag in his hand. He also equates being in a bar at 2 a.m. to picking up kids from nursery school (the strange yelling, the lack of potty training, there’s always somebody crying). Even when Gaffigan’s not talking about food, the subject seems to magically come back to…well, food. His trip to The South, with its slower pace, is the result of them eating biscuits and gravy…for breakfast (chicken and waffles for lunch). Then there’s fried bread in Arizona and New Mexico, which he says is the exact opposite of a diet. 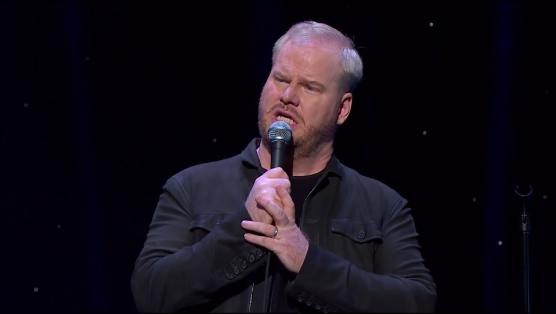 Gaffigan is still one of the few stand-up comedians who keep their acts clean. But you hardly notice. His observations on the every day American (and the food we consume) are hilariously spot-on. Obsessed is classic Gaffigan, although there are fewer belly laughs than on 2012’s Mr. Universe (however, a second run though Obsessed reveals some real gems). One thing missing this time around are Gaffigan’s usual high-pitched inner monologues/audience reactions, which have probably run their course for some anyway (I’m sure they’ll be back). Food, on the other hand…don’t expect Gaffigan to ever push that away.